Our Sign Stands are available with a full range of frames up to 22" x 28" poster size. The Sign Stand range features heavy-duty frames and posts with a solid cast iron base ensuring maximum durability. The frame can accept 1/4" thick material and is supplied with clear acrylic inserts for use with light weight posters. Queue Solutions 6' Signage Stand raises your sign above the crowd for visibility from a distance. 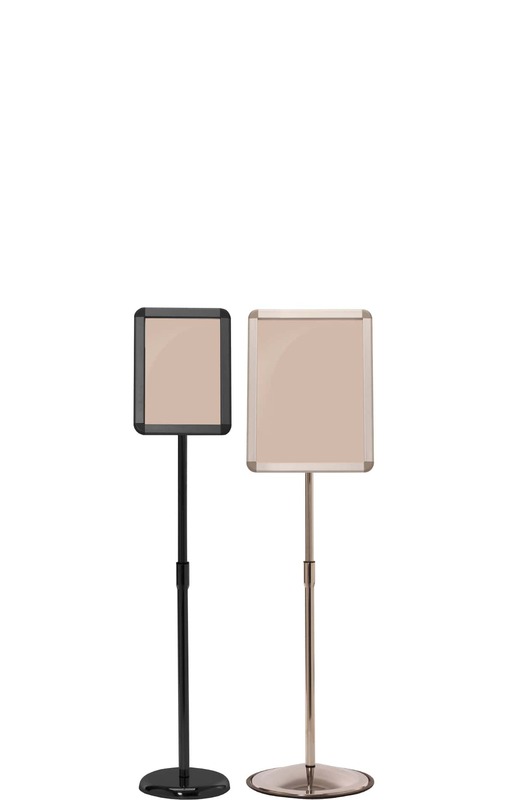 The sign stand has a two piece construction which allows for compact packaging and low freight costs. 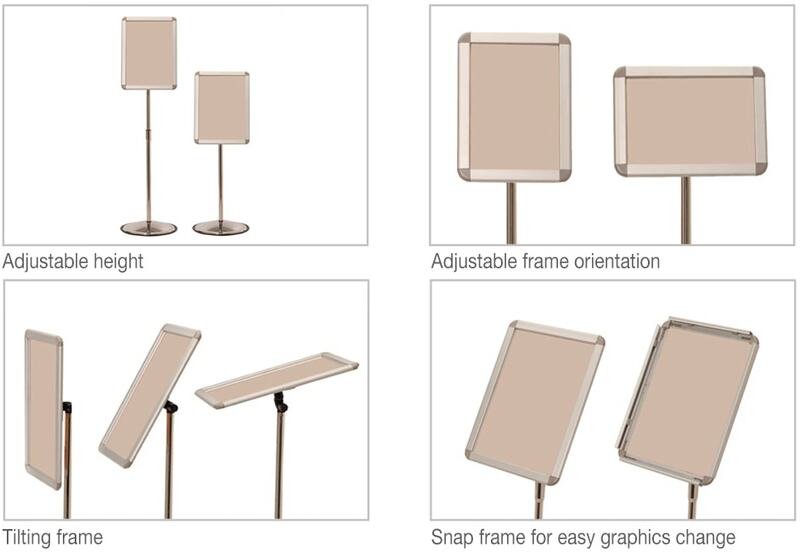 The Snap Frame Stand is one of the most versatile sign and poster displays available. 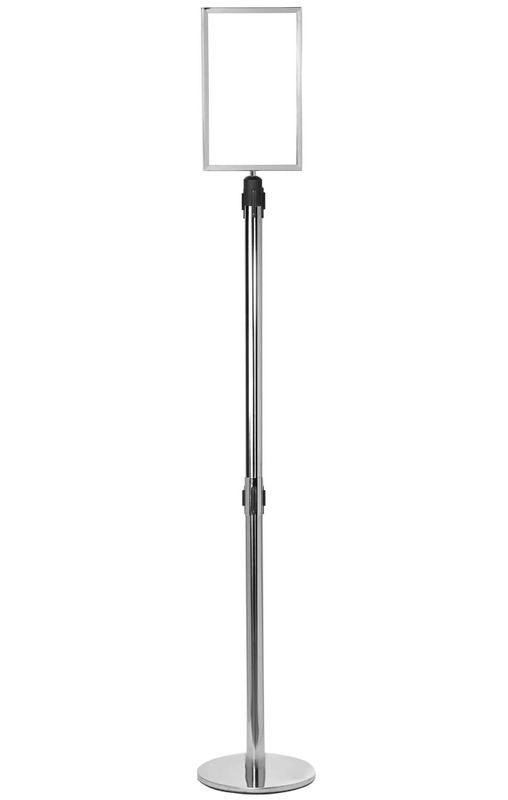 The adjustable height post and rotating frame make this unit like buying several stands in one! The telescoping stand has 14" range of adjust-ability with the highest setting being 45" (to the center of the poster graphic - overall height is taller). The height is adjusted by the push of a button and pulling the post up. Queue Solutions poster stands are the ideal solution for providing information, discount or direction.The Poster Stand range features heavy duty frames and stands for maximum durability. The standard frames are top loading and the A frames are snap opening so fitting signs is simple and fast. Sign material up to 1/4" thick can be used or when lightweight posters are used clear acrylic inserts can be supplied to keep the sign in place. Queue Solutions 'A' Frames are ideal for places where easily changeable signage is key. Businesses such as restaurants that want to display their daily specials to customers, all the way to event notifications and sales promotions, the applications of these 'A' Frames are only limited to your imagination. Our 'A' Frames store flat and have easy to use snap frames for super fast and easy graphic replacement.